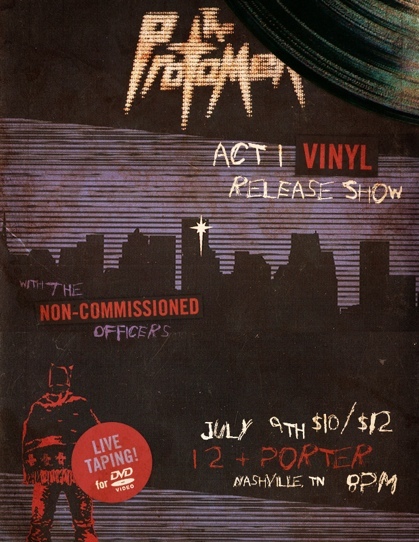 On the night of July 9th, we’re going to play a special show in Nashville, Tennessee, America, Earth, to celebrate the the fact that it’s taken us nearly 6 years to release our first album, “The Protomen” (Act I), as a 12″ LP. This special edition first pressing of 1,000 will be colored vinyl (split blue/red), and will include a 22″ x 22″ foldout poster of never-before-seen first album concept artwork, as well as a 10″ x 10″ stencil (so you can tag all kinds of “things that you own”). This limited version will also have the original endings of multiple jams (future pressings will not). Get them when you can. Because of the fancy nature of this occasion, we decided to ask our good friends The Non-Commissioned Officers to join us for party and tea. They accepted! This night will be the most fun. Now, I know most of you may be wondering, “when can a person like me, who lives in Egypt, order one or twenty of those records on the lines?” The answer you seek lies here: The LP will not be available online until the morning after the release show at 10am Central (availability will depend on how many survive the night). And if all that isn’t enough to get you all riled up booking tickets for all sorts of planes and your fancy rocket ships, maybe this will do the deed. We’ve decided to attempt a sort of live DVD (and maybe album?) recording for that night. And maybe you can be all up in it? Exciting, right? 16th – Orlando, FL – Nerdapalooza — (We play Act I) Ticket Price goes up on June 1st. 17th – Orlando, FL – Nerdapalooza — (We play Act II) Ticket Price goes up on June 1st. And as for all those TBAs in there….keep your good eye locked on our TOUR PAGE. It will keep you informed. We got a call the other day from some dame that claimed she was the hawttest of hawt sensations in the 80s. We thought it was Uncle “Stinky Thumbs” Arbuckle pranking us again, but we were wrong. It turns out she is the most real Tiffany of all the Tiffanies that we’ve ever spoken to. She said she wanted us to be her date to the 5/25 party at fooBAR.too in Nashville, America. How could we say “no”? We couldn’t, that’s how. It’s going to be The Awesomest. A couple weeks after that, we’ll be visiting the hot hot mess that is Texas, America. Much like the Tiffany situation, we got a conference call from Ween, Chromeo, Big Boi, and the guys in Guitar Wolf (although we couldn’t understand them) about joining their fun time weekend in Houston at Free Press Summer Fest on June 4th. We took their physical challenge. We’ll be visiting some favorite cities en route as well. Come out to all the shows….maybe you’ll make it into the documentary?! There are only a few of them, so we’d better see you at every one. As for July, well, let’s not spoil Christmas for you just yet. Let’s just say it might have some other tours and maybe the release of a new format of something old and maybe a live DVD taping. More details soon…maybe. p.s. If you don’t know who Tiffany is… shame on you. Fix that immediately.